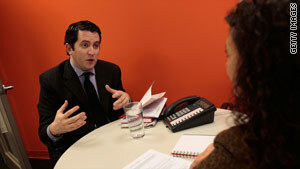 Hiring managers talk about some of the worst job interviews they have ever seen. "I once had a candidate tell me her last boss was a drug addict and did cocaine regularly"
(CareerBuilder.com) -- Most job seekers have a case of the jitters before going on a job interview. Anxiety's normal, but almost always those butterflies were in your tummy for nothing. The interview goes well, you don't make any serious mistakes and you exhale the moment you walk out of the room. Sometimes, however, the interview goes terribly wrong. We're not talking about little mistakes, like spilling coffee on your shirt while you're in the waiting room. No, we're talking about the odd behavior that 99 percent of us wouldn't commit. Hiring managers have given us some examples of the worst missteps they've seen in interviews, and we've compiled the best. "I once had a recent graduate who looked fantastic on paper, but showed up wearing flip-flops. During the interview, he would lean back in his chair, flex his hands over his head and he even said several curse words in his responses. It was so bad I e-mailed him afterwards to point out his most obvious blunders!" -- Nickie Doria, marketing director for Emmer Development Corp.
"I happen to be hiring right now. One line that is a definite door-closer, that I have surprisingly heard several times: 'No, I haven't really had time to look at your Web site yet' or words to that effect. How interested should I be in a candidate with such a low level of interest in and knowledge about our company?" -- Alexander Seinfeld, executive director at Jewish Spiritual Literacy Inc.